We made the drive down to Alamogordo and over to the White Sands of New Mexico. I had seen photos of this place before, but it is so hard to fathom the scale of locations with a single photo. White Sands is absolutely incredible and is another spot not to be missed on a journey out west. The sand is not your typical sand, it is actually ground down gypsum. 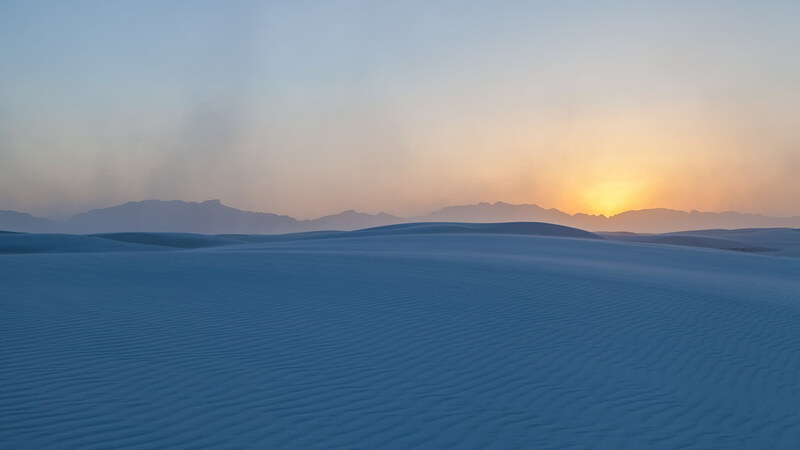 White Sands is the world’s largest dunefield of gypsum sand and covers 275 square miles. It is a place to get lost in. Hike over a dune where all you can see around you is white sand and you are instantly transported to a world away from what you would think of as Earth. It is absolutely like being on a different planet. One of the coolest features of the white sands is that there is so much of it, and all of it reflects the color of the sky. Hence the blue hint to the sand in this photograph. I could drive out west just to see the sands and camp here for a week capturing beautiful photographs. The White Sands of New Mexico is a place of pure beauty which I highly recommend visiting at least once in your lifetime.